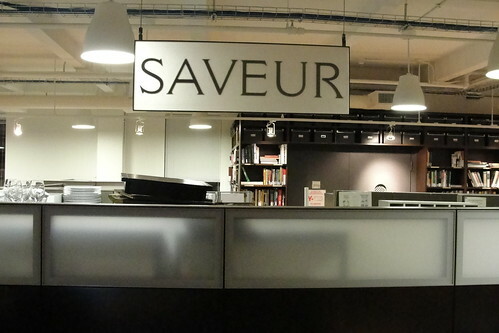 I finally got the chance to meet and greet with some of the friendly staff over at Saveur last night. It still seems ethereal to me to think that I worked as a fixer and gatherer for the upcoming March L.A issue as a whole, driving Mr. Oseland around South L.A in my dad's jerry-built, 93, stick-shift Saturn, scavenging Southern, super exotic Mexican Herbs for herb photo glossary...not to mention having two featured pieces printed. My nervousness only grew as the numbers on the buildings on West 32nd street kept getting smaller. I had took a train that required me to walk a little bit longer...on purpose. To no avail with my freakishly lengthy legs, I was there: 15 East 32nd Street. 1st floor, 2nd floor...then there it was. 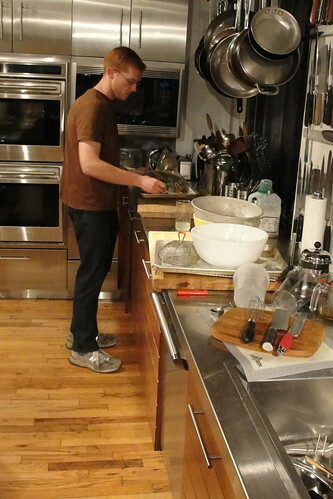 Ben Mims had just finished frying up some shrimps and oysters, to be the centerpiece of the dinner. Po' Boys here included just baked, dense french rolls, a freshly mixed tart and creamy Remoulade Sauce, juicy, sweet tomatoes still on the vine (even in the dead of Winter!) and an Ambrosia salad, with a toasted coconut topping. Their dessert choice of the night was nothing short but ridiculously awesome...of course. 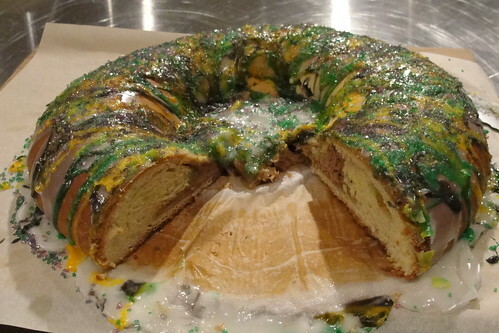 A Mardi Gras Kings Cake, a celebratory treat standard down south around this time of year. 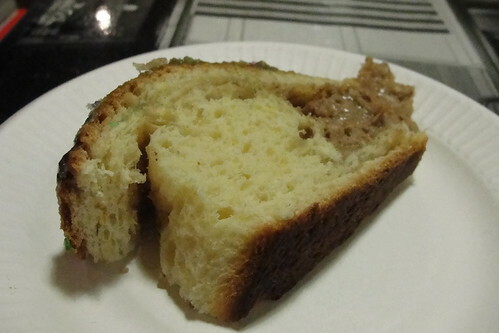 Usually more on the dry side of cakes with a jam filling, sugar and dried fruit topping, the version here was fluffy, with a cream cheese and brown sugar filling spilling out and caramelized with crunchy, multi-color icing. Ben described it to me as "basically a cinnamon roll, but shaped differently and extra decadent!" Just like a Mexican Rosca De Reyes, a jesus doll is baked in somewhere in the reef shaped roll, and it is tradition to throw a party for whoever bites into it first! I overheard that a whole pecan was used here, but no party for me. No Party For Me: Should Have Gotten Another Slice! So That's How They Roll, huh? What an awesome experience! 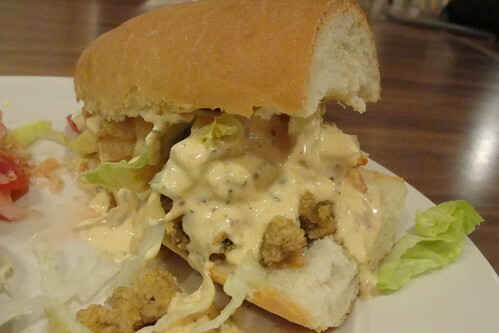 Your Po' Boy looked KILLER. 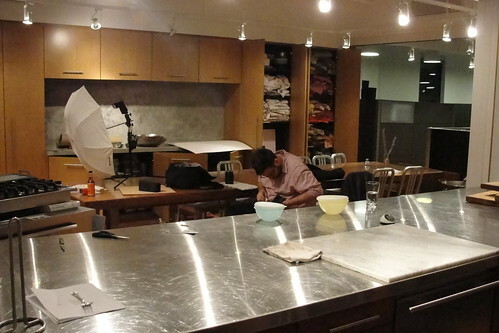 I got to visit Gourmet Magazine back in 2005, and am so grateful for those memories! 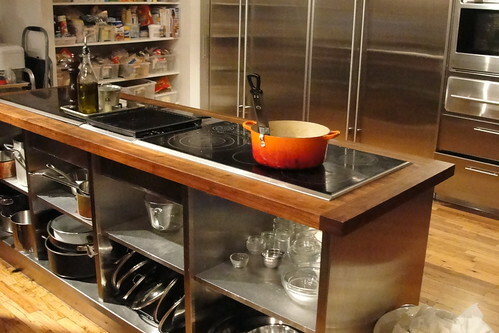 Looks like an awesome experience at Saveur. They have now officially been Glutster'd. nice that you got to nosh with the Saveur staff. I just got the issue in the mail yesterday. You're gonna love it. It does our city justice. MLB: Really? awesome! did you have a gourmet meal there too? Food GPS: Glutster for adjective use! Yes! 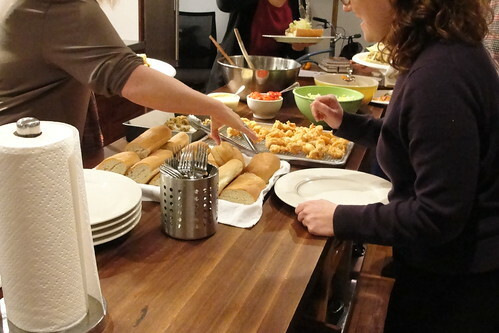 gastronomer: seriously! kudos for your Korean twice fried piece! Carmen: yes, can't wait to do that podcast with you! wow, what a great experience!! can't believe you drove around mr. oseland! did you call him that the whole time?